Okay… Now, I’m really confused. Boruto just went from being a mediocre show to something pretty darn exceptional, all in the span of two episodes, and with the ultimate payoff still looming. Boruto almost feels like a different show this week, one that really knows what its doing; both in terms of planning and execution. Boruto’s first cour has been rough, but in the end it turned out to be one of the few series where the destination actually outweighs the journey. See, I get what Boruto was trying to do, now. The show needed to give everything a sense of normalcy. It had to show that everything would always be sunny and fine, that there were no real consequences or high stakes, BEFORE it went forward and actually added those very stakes it was suggesting couldn’t exist. It was a pretty ambitious ploy to pull the rug from under the audience, and I will say that in the end, lead up aside, It did work. Last week hinted at Sumire (Class Rep) being the villain, and that was exciting and unexpected, for sure. There was still a worry, however, that Boruto may very well fumble this grand reveal, and it might just do what it did when Shino went all crazy near the start of the series. Watching even the opening moments of this week’s episode, however, definitely throws that very notion out the window. In fact, from those very opening moments, this episode feels more like a Naruto episode, than a “Boruto” one. 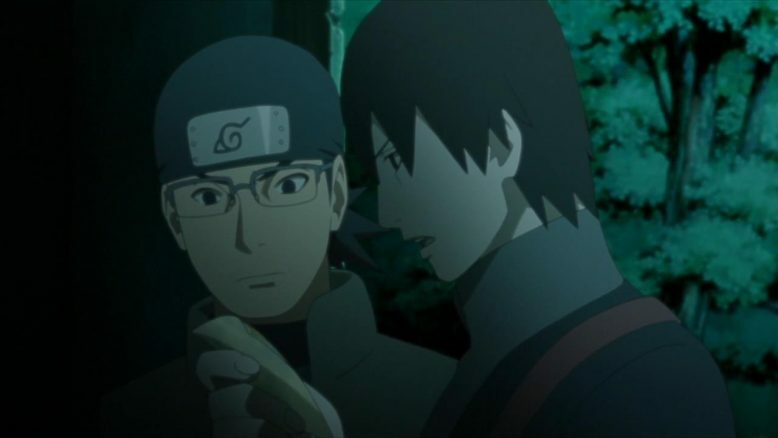 There’s a dark conspiracy that ties back to Danzo and even links up Sai’s checkered past. 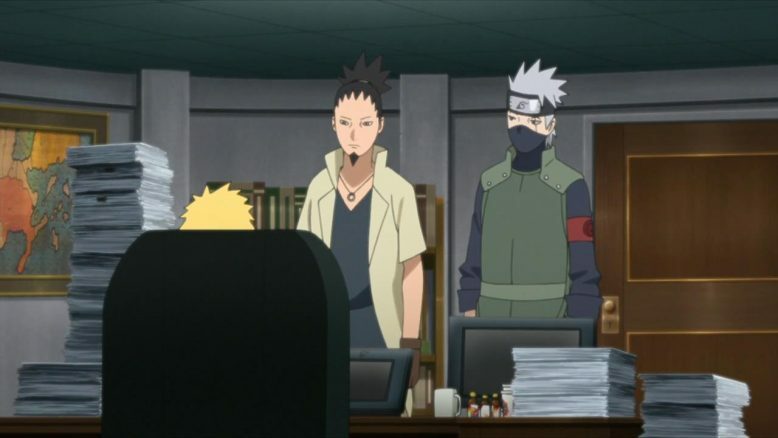 There’s Kakashi himself coming back into the fold to help out (although how the guy has barely aged a day is beyond me), and then there’s also a general sense of crisis among the “adults”, as the Ghost incident hits pretty close to home. That’s all well and good, but what really establishes the stakes, is Sumire being the mastermind behind the incidents themselves. 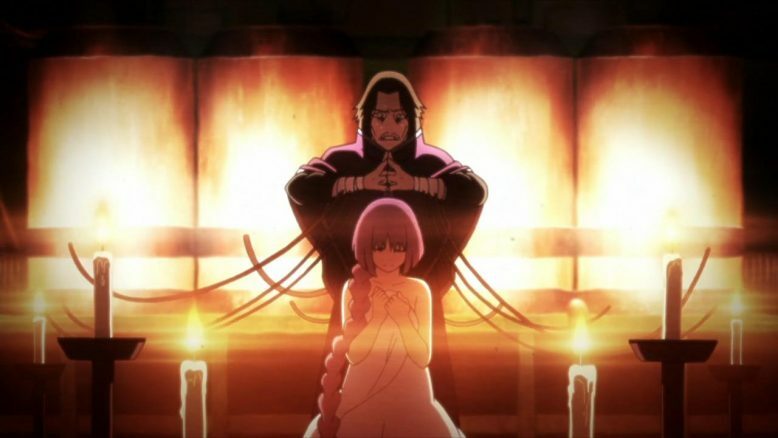 Sumire has it all, a father that was the leader of a bunch of cultists, and a vengeance hungry past that refuses to release her. Tied to that past is definitely a promise to her father, and its the concept that really links Boruto, Sumire and even Mitsuki together in a pretty awesome way. Its ingenious to tie Sumire’s core to that of both Boruto and Mitsuki. Here we have three kids that have had very different but important parents, all that provide a decent chunk of baggage. Boruto had the arguably best childhood out of all of them, but he’s also the most defiant and different from his father. Unlike Mitsuki or Sumire, Boruto’s father doesn’t define him, nor does he command his path in life. Boruto’s a different person, and arguably a better kid than Naruto himself was (as I’ve said ad nauseum at this point). 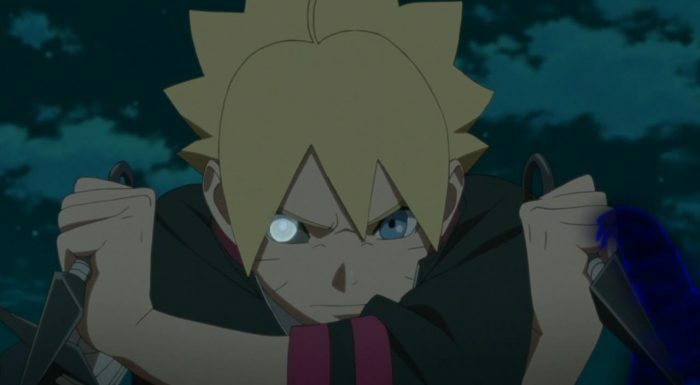 That symmetry is definitely cool, but what makes this particular event so interesting is that it gives Boruto his own kind of challenge, different from the ones his father has faced. Boruto isn’t fighting to protect the village, nor is he some hero at this moment that’s taking on a villain. What Boruto’s fighting for is basically his friends and his life with them. 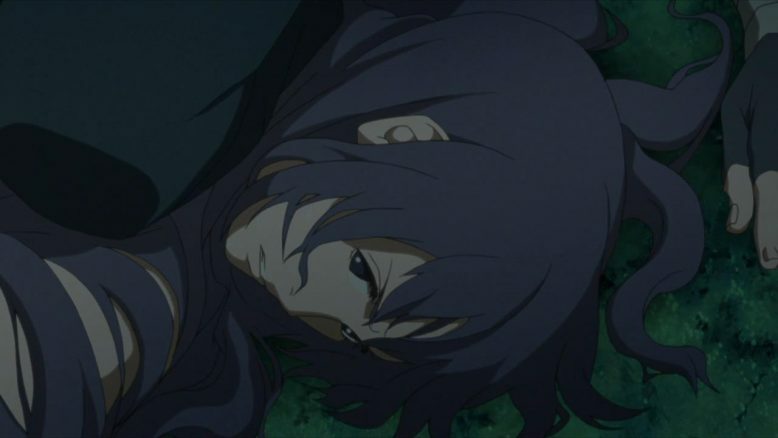 Boruto is all about “everyone making it together”, so what can the guy do when someone like Sumire has been lying to him all this time and is trying to kill everyone around him? Plus, to complicate matters, he has to hold Mitsuki off, who’s now got orders to kill Sumire from Orochimaru. 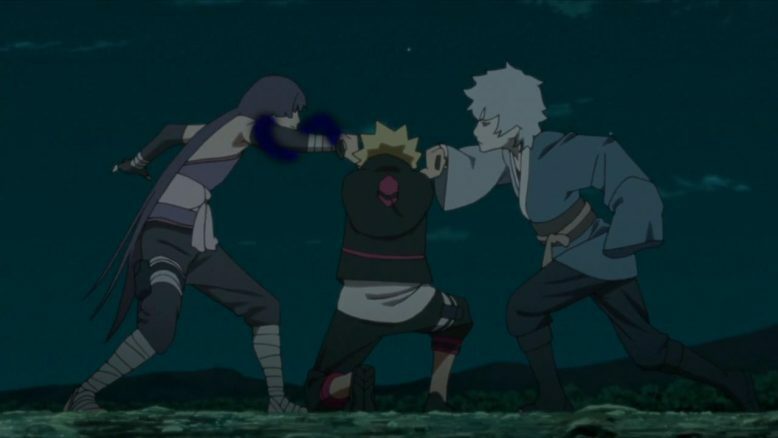 And at the end of it all, I love the place that Boruto picks for himself, square in between Mitsuki and Sumire as the two try to attack each other. Its predictable sure, but its the sort of thing YOU WANT to see from Boruto. You want Boruto to find a way to save everyone, especially in the sort of situation that the show has put him in. Can he? Can Boruto actually save Sumire, and succeed again? For once, I’m actually curious and rooting for Boruto to pull it off. If Boruto does save Sumire and stop this, then it will feel earned, and if he doesn’t, then this will be a sad tragic story that will serve as Boruto’s transition from child to adult. There’s no way the show can lose at this point, which is a far cry from literally every episode until last week. I’ll admit, I was this close to dropping Boruto, and perhaps even taking it a bit easy on blogging in general. Leave it to this show redeem itself and renew excitement for both itself, and myself as an anime fan.